Over the past week, the young male orca K-33 and presumably most of K pod has traveled out to the Pacific Ocean and down the Washington Coast into Oregon. The 15-year-old named Tika has been carrying a satellite transmitter since New Year’s Eve. 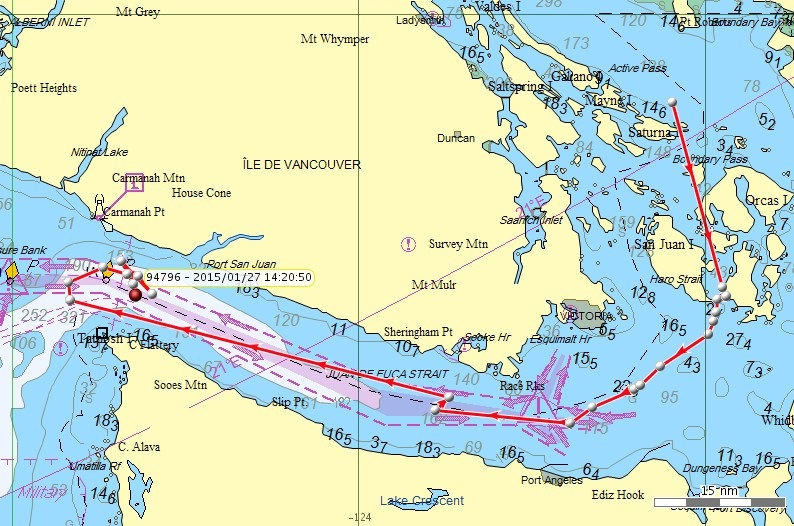 A week ago, Tika and the other K pod whales were in the northern portion of the Strait of Georgia in Canada. See Water Ways, Jan. 7, and NOAA’s Satellite Tagging page, Jan. 7. 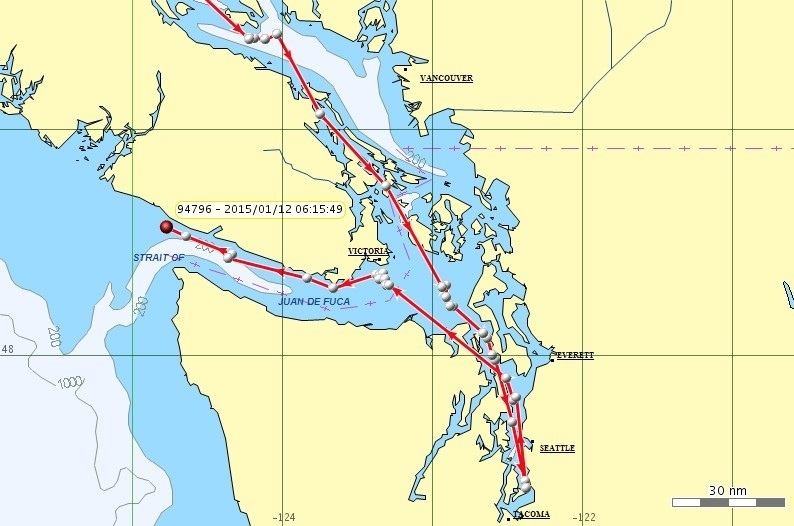 On Thursday, Jan. 7, the whales turned to the south and by the next evening they were headed through the San Juan Islands, reaching the ocean late Saturday. 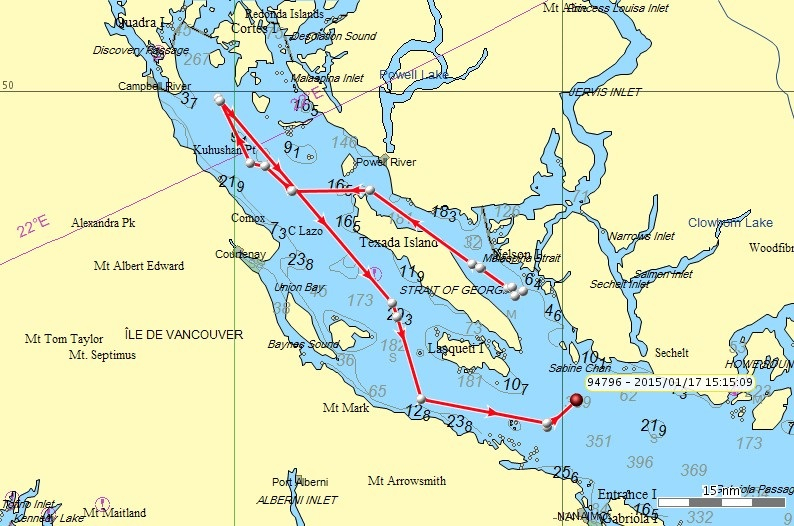 On Sunday, the whales spent most of the day near Swiftsure Bank, a well-known ocean fishing area on the U.S.-Canada border, then headed south along the coast. After pausing briefly near the Hoh River and again near Grays Harbor, the whales reached the mouth of the Columbia River on Tuesday. They didn’t stop there but continued south into Oregon. Midday on Wednesday, they were off Depoe Bay. 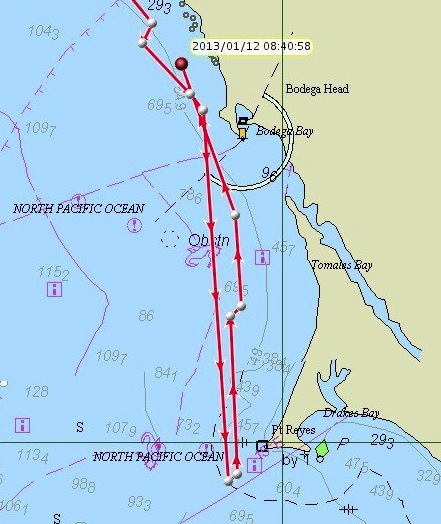 They reached the Umpqua River yesterday and by this morning were rounding Cape Blanco in Southern Oregon. “This southerly excursion in January is similar to what we observed in 2013 when we had K-25 tagged,” noted Brad Hanson, who is heading up the study for NOAA’s Northwest Fisheries Science Center. See his 2013 blog and notes from this year’s tagging program. On a related topic, Ken Balcomb and other researchers for the Center for Whale Research have been getting out on the water more this winter to observe both resident (fish-eaters) and transient (seal-eaters) killer whales. I enjoyed listening to his description of the latest encounter with the two groups of transients on Wednesday. Ken offers a voice-over while shooting video on the water as well as later at the center while identifying the whales. 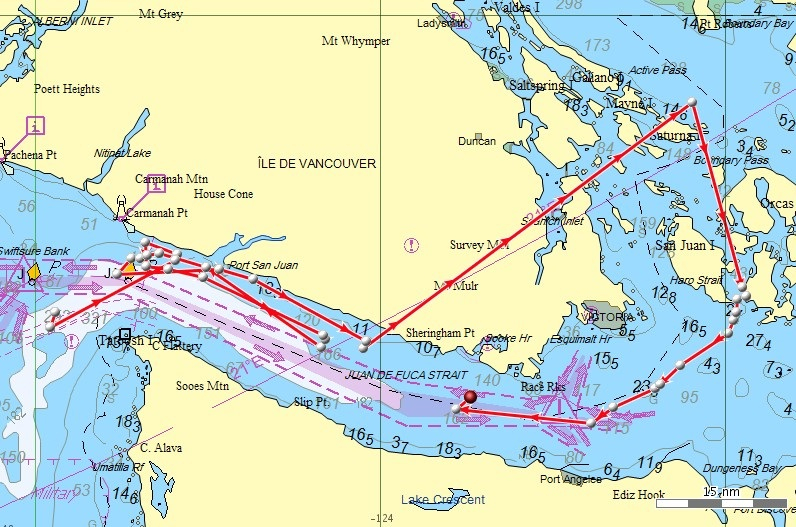 As he describes, the encounter took place near Kelp Reefs in the northern portion of Haro Strait (west of San Juan Island). Watch the video on the website of the Center for Whale Research. 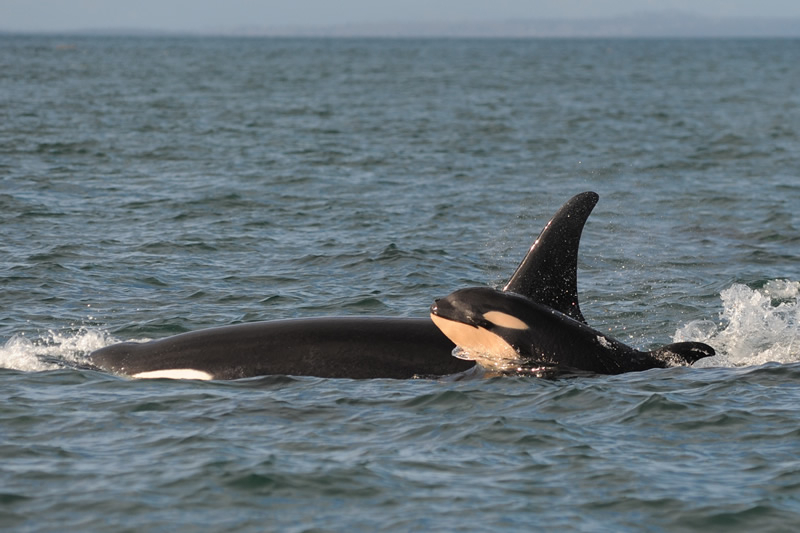 Tracking J pod for 30 days — mostly during the month of January — lends support for the idea that this group of Southern Resident killer whales strongly depends on the inland waters of the Salish Sea, perhaps more so than K and L pods. A satellite transmitter was attached to L-87, a 22-year-old male orca named Onyx who has been spending his time with J pod. The tracking effort is part of a study to determine where the whales travel in winter. 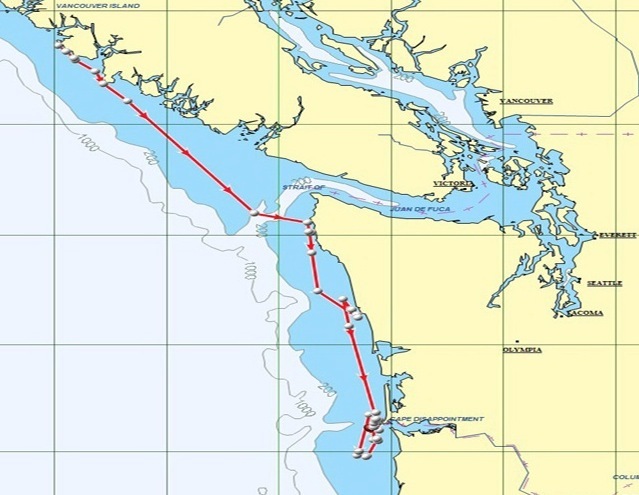 While one month of tracking doesn’t prove much, it is interesting to know that J pod can hang out for days around Texada Island in the Strait of Georgia without being noticed. The following video, courtesy of the Northwest Fisheries Science Center, depicts travels of the whales from Dec. 26, when the tag was attached, to Jan. 23, when the tag apparently fell off. View large in new window. 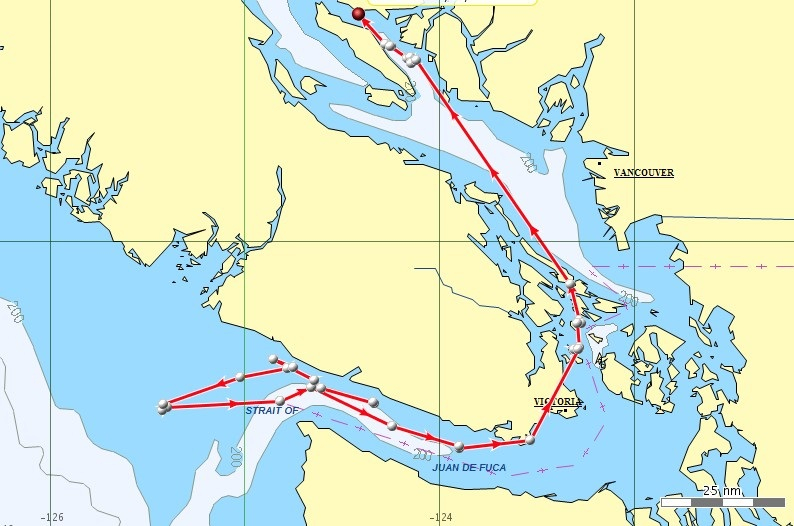 The tracks end just as the orcas seem to be leaving the Strait of Juan de Fuca, but so far we don’t know if they continued or turned back. 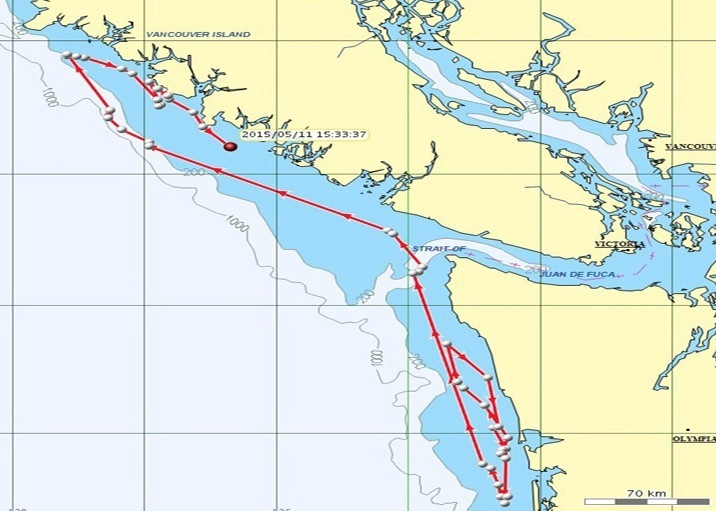 When the whales moved into Central and South Puget Sound, as shown by the satellite tracks, observers watching from shore and on ferries reported the whales each time, noted Brad Hanson, who is leading the tracking study for the NOAA’s Northwest Fisheries Science Center. On the other hand, the whales were infrequently reported while in the Strait of Georgia and Strait of Juan de Fuca, he said. 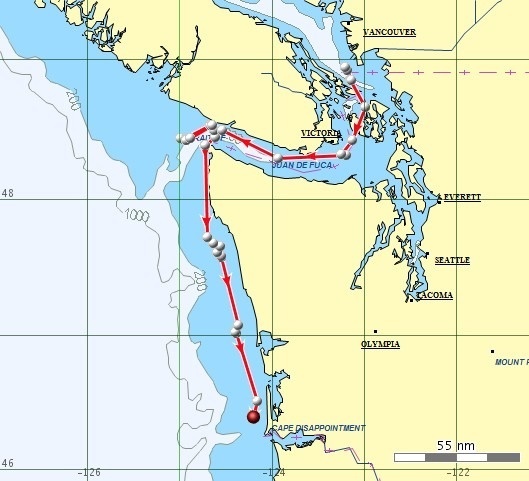 In summer, J pod often moves north into Canada but not much beyond the Fraser River near Vancouver. 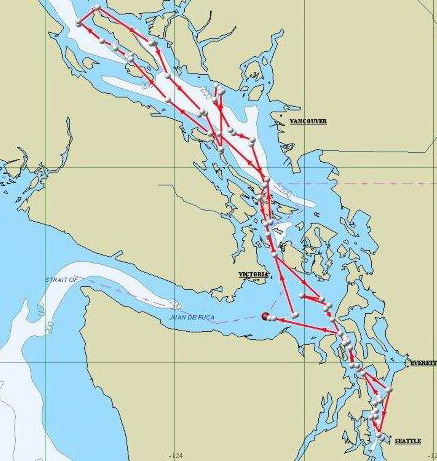 These winter travels show the J pod moves farther north and stays in the northern part of the Strait of Georgia for extended periods of time. What they are finding there to eat has not been fully studied, but some percentage of chinook salmon reared in local waters are known to stay inside the Salish Sea, never swimming out to the ocean. 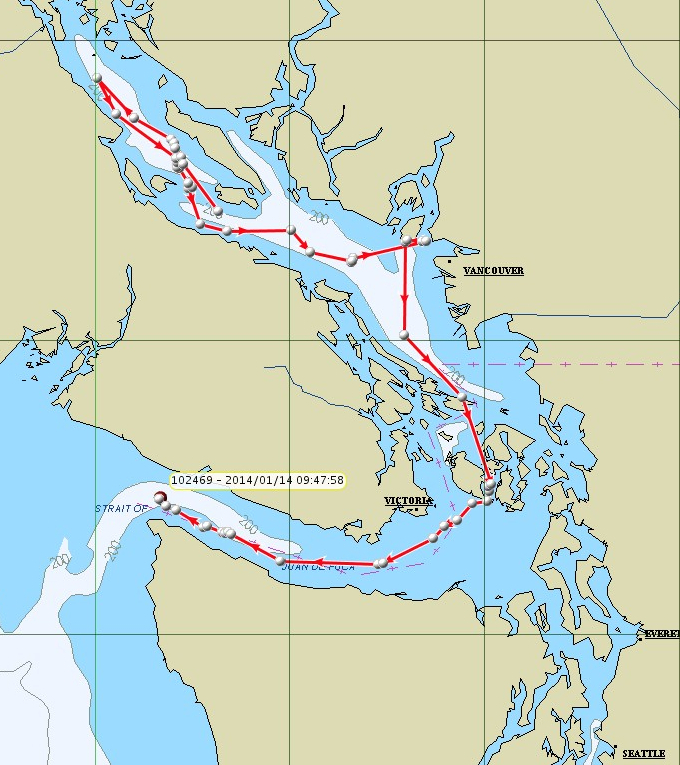 Past studies based on recorded killer whale calls have shown that J pod moves into the open Pacific Ocean on occasion, but the whales rarely travel very far down the coast. The recording equipment was moved this winter to strategic locations to better distinguish how far south J pod travels in winter, Brad said. Over the next couple months, researchers will continue to look for opportunities to attach tags to killer whales, he said. 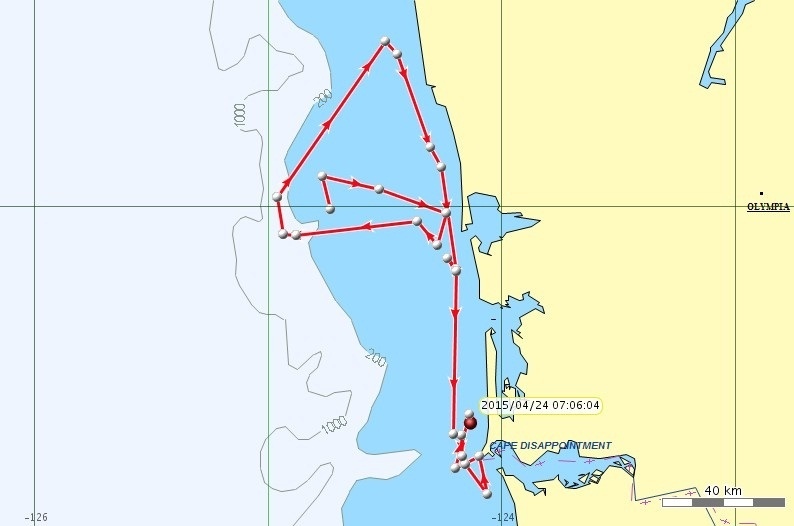 A cruise aboard a large research vessel in March will attempt to follow the Southern Residents, identify their feeding areas and determine what they are eating in the ocean. For the past 10 days, L-87, and presumably J pod, seemed happy to just hang out around Texada Island in Canada’s Strait of Georgia. 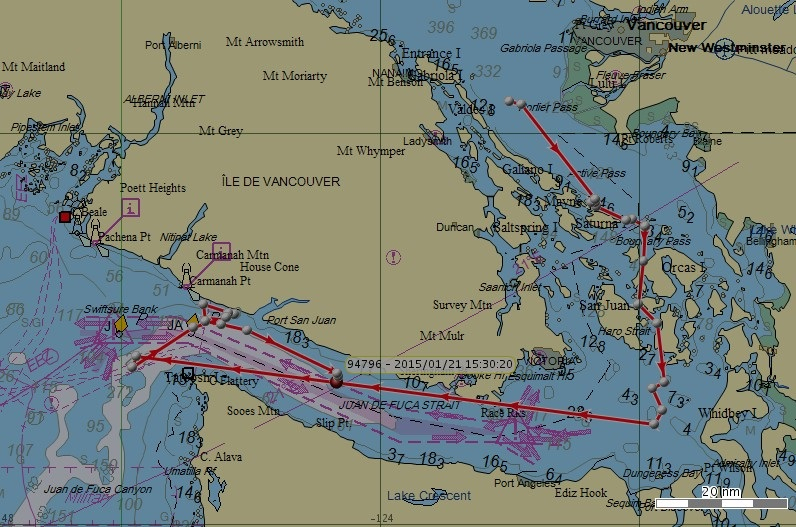 Then they headed south around the southern end of Vancouver Island and into the Strait of Juan de Fuca, according to researchers with the NOAA’s Northwest Fisheries Science Center. 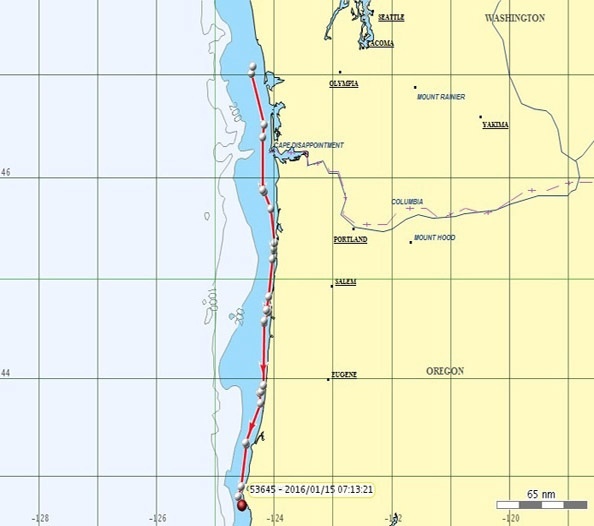 As of this morning, the killer whales had just entered the open ocean, as shown in the map on this page. L-87, a 22-year-old male orca who travels with J pod, has been tracked by satellite since Dec. 26, when researchers attached a transmitter to his dorsal fin in the Strait of Juan de Fuca. See Water Ways, Jan. 3, 2014. The pod’s movements around Texada Island can be seen on the series of maps updated every few days by the researchers, led by Brad Hanson. 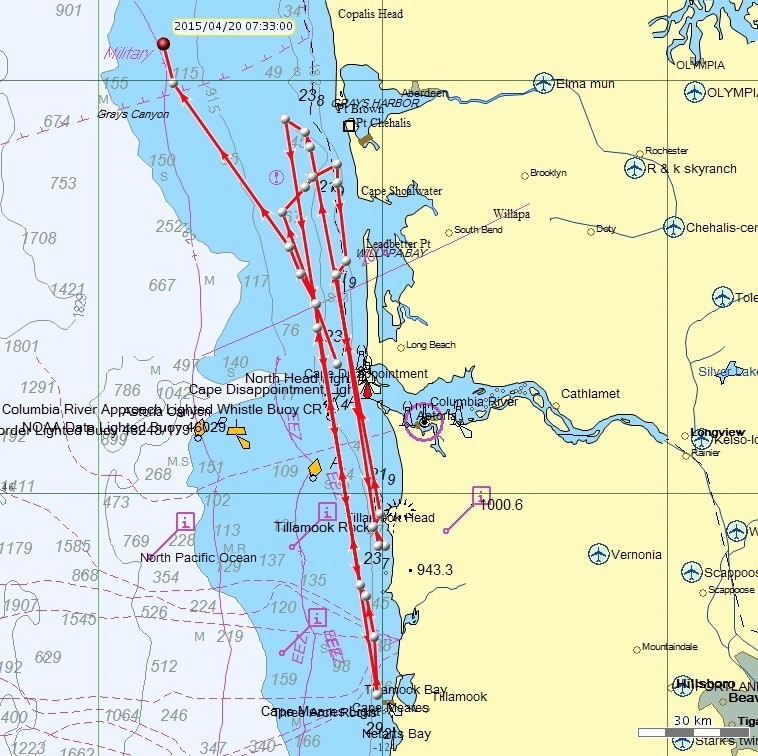 Check out 2014 Southern Resident Killer Whale Satellite Tagging.